Until you look a little deeper into the matchups, there’s not a lot of high-profile games on this week’s Utah high school football schedule. There are, however, a number of games with significant intrigue and that’s where we went for our big game of the week and nine more contests to watch. Once this week’s games are complete, just about every team in the state will have played at least one region game – the notable exception is playing in the top game of the week. East hosted a highly regarded team from Arkansas last Friday, picking up an impressive win and this week, teh Leopards are on the road against perhaps the most storied program in the nation. The in-state action begins Friday night at 7 p.m, while East kicks at 7:30 p.m. in California. It’s a high school football program that has inspired movies, that holds the record for the all-time longest winning streak. A year ago, De La Salle was right where it often finds itself, the best team in the state of California. 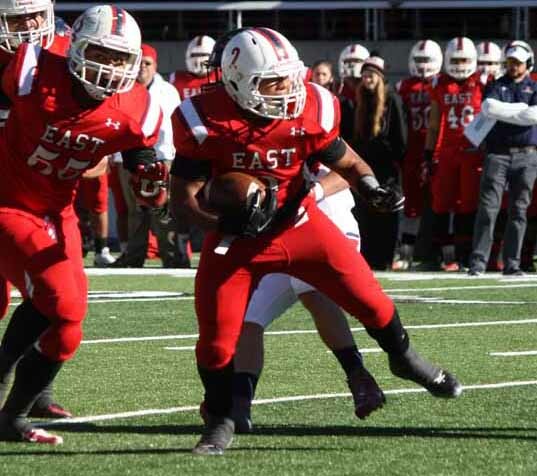 Friday night, East High travels to Concord, California to see how the best in Utah football matches up with one of the top teams in the nation. A win in this one would be huge for the state. To watch the game, assuming you aren’t traveling to the Bay Area, you’ll need to log onto the SFGate.com website of The Cube for the live stream, but it would be worth finding it to check it out. The Spartans have weapons all over the field, on offense and defense, and are coming off a come-from-behind 28-27 over Servite of Anaheim, when 5-foot-8, 185-pound junior running back Kairee Robinson scored the go-ahead touchdown followed by running in a two-point conversion. Robinson and Jon Hackett are two options in the running game for DLS and Tre’ White is a huge weapon on offense and in the return game. This contest is a chance for East running back Jaylen Warren to showcase his skills in a national headliner game. The senior averages 14 yards per carry and has 841 yards and eight touchdowns rushing on a team that scores nearly 50 points a game, while pretty much exclusively running the football. The Spartans will know what’s coming and we’ll find out if an elite national power can stop it. The other big strength for the Leopards has been on defense, where Sati Tu’uhetaufa, Helaman Su’eSu’e and Jordan Lolohea lead the way. Lolohea has nine sacks in four games this season. Fremont has played four games and won all four by large margins. Roy hit a rough patch in a Week 3 loss to Corner Canyon, but otherwise the Royals have been very good as well. The Roy administration is expecting standing-room only for this early, very important contest. These two teams meet early in the league schedule in a game that will have a lot to say about who ultimately wins Region 1. The Silver Wolves have scored 174 points in four games…more than 40 points per contest so a very good Roy defense will be tested. It’s up to Nathan Anderson and company to put enough pressure on Fremont quarterback Saxton Morby to make things interesting. Anderson has five of the Royals’ 13 sacks this season. Morby is one of the state’s most efficient passers, completing nearly 75 percent of his throws for 788 yards and 12 scores. Haze Hadley is the top target, with 40 catches for 438 yards and a whopping 10 touchdowns. 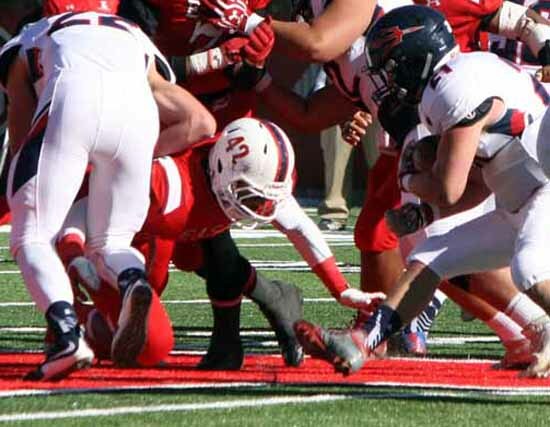 The balance comes from Austin Freeman, who runs for more than 100 yards per game and averages eight yards per rush. Jaden Sabin is Roy’s counter to Morby, an efficient passer with seven TD tosses and 23 yards per completion. The Royals split the running load between Hunter Mather, Trace Tupe and Keenan Johnson, and they will need that trio to come up big to control the ball and keep Morby and company on the sidelines. Region play gets underway this week in the state’s most competitive league. In most sports, we call this “Region 9” but with the additional region that is in play for football, it is now 3AA South. Desert Hills is at Cedar this week and it’s a matchup between two teams with very similar resumes. After losing 28-21 to 5A Jordan in Week 1, the Thunder have run off three straight wins by a combined score of 105-7. 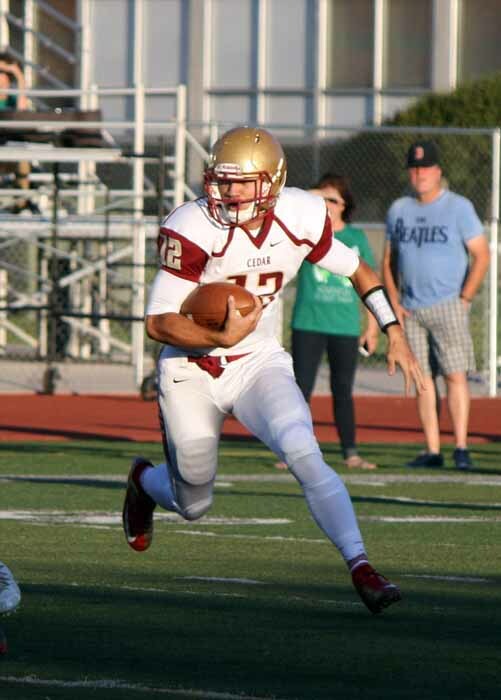 The Redmen dropped a 35-21 contest at Provo Week 1, but have won their last three by a combined 95-27. It’s a battle between dual-threat quarterbacks Quinn Kiser of Desert Hills and Mason Fakahua of Cedar. Kiser shares the running load for the Thunder with Brock Parry and turns to Logan Hokanson as a primary receiver, while Fakahua works well alongside Drake Lewis as a runner and his leading pass catcher. This one will be decided when we find out which defense best slows the opposing quarterback. Jake Stokes leads the way for Desert Hills in that regard and Jade Bulloch is the outstanding leader of the Cedar resistance. Tooele opened 3AA North play a week ago with a loss to Stansbury. The Stallions are a good team, but that was a slight upset and that puts Tooele in an interesting position. After reaching the state semifinals a year ago, the Buffaloes really need a win this week against Ridgeline, the first-year program that looks like a league front-runner. The Riverhawks lost Week 1, but they have been very good since. Levani Damuni had a breakout game last week running the football and Cody Olsen has been good for Ridgeline all along. Damuni, Davis Nixon and the Riverhawk defense are key to the team’s success. Can Ridgeline stop an all-out downhill running attack? That’s the question for this week as Tooele will send Lincoln Powers (nearly 9 yards per carry) and his 694 rushing yards and six touchdowns, with Jeno Bins and Michael Dunn adding other run-game options, right at the Riverhawks. The last new kid on the block to find early success in football, Corner Canyon, hosts the most recent highly successful new guy in an important Region 7 game. With Alta and Timpview looking like the teams to beat in the league, and with Provo also being very good and Orem as a wildcard in the equation, these teams need to stay in the mix. That is particularly critical for the Chargers after that close-game loss to Orem a week ago put them a game behind the field early in the region standings, but the Falcons also need to stay where they are. This should be a great matchup. Skyridge has a big-time offense, led by Cody Frampton, who has thrown 12 TD passes and is also the team’s leading rusher. Brendan Roper and Josh Hadfield help balance out the running game, but receiver Wyatt Parkinson is a key matchup for the Corner Canyon defense. The Chargers two losses both happened late, and both were by just three points. They need to be able to get a lead this week and then they need to close well. Zach Wilson to Colton Lawson is a key connection in the passing game, with the running of Jason Adams providing the balance. Things are always better when a rivalry game features two teams that are competitive and that is now the case when Timpview and Provo get together. The Tony McGeary era at Provo has re-introduced these two to the rivalry. The Thunderbirds are sure to be motivated after dropping their Region 7 opener at Alta last week and the Bulldogs will have to be ready. It’s not clear if Provo is close enough in the talent department yet to match its cross-town rival, but one matchup that will be worth watching is Provo receiver Ty Jones (seven TDs and 26 yards per catch with 26 grabs for 631 yards) against a T-Bird secondary led by Chaz Ah You. The college recruiters will surely be watching that one. 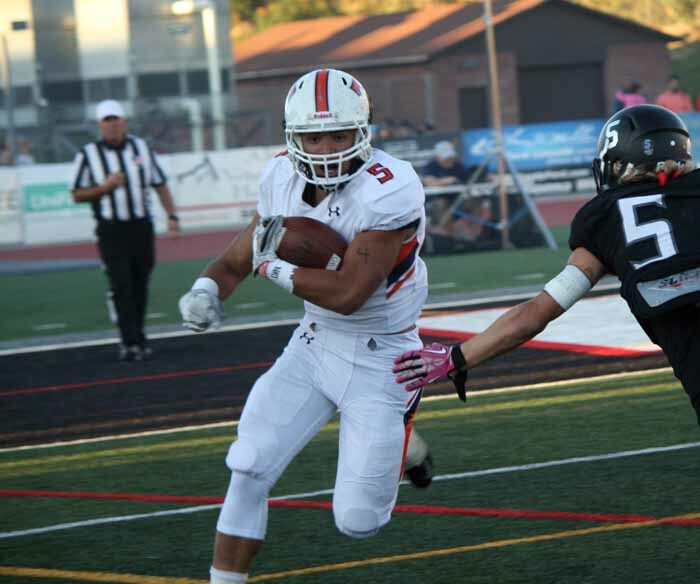 So far, Timpview has been alternating quarterbacks between pass-first Jordan Mariteragi and a more dual-threat option in Jake Biggs, with running back Alema Te’o as the team’s most consistent offensive threat, at least to date. When they’re throwing it well, Ah You and Kyle Van Leeuwen have been outstanding targets for the Timpview passers. Joey Tolutau and the Bulldog defense will have their work cut out for them, but they will be hoping that quarterback Spencer Jorgensen can hit on some big plays with Jones and Tavita Ika, who scored two kick return TDs last week as well. Jackson Craven leads a fierce Timpview pass rush, with Karene Reid and Terrance Faumui also part of the group that could make it a rough night for the Bulldogs. Coming off an overtime win over Davis to open Region 2 play last week, Viewmont is feeling good heading into another key league matchup. The Vikings have been inconsistent throwing the ball, but with Cortland George and Jacob Barnum carrying the load, they have been proficient on the ground and that will be key facing a Titan team that has intercepted eight passes so far, paced by three from Brennon Jones. Mostly, Viewmont wins because Alex Holdaway and Chandler Stafford lead an outstanding defense that has yielded just 51 points through four weeks. Since giving up 67 points to the East juggernaut Week 1, Syracuse has found itself a bit on defense, allowed fewer than 10 points per contest. This one has the makings of a 10-7 game, which means Ty Metcalfe, a threat as a passer and runner for the Titans, has to be on his game. When he goes to the air, NJ Mo’o is a frequent recipient. The game to watch as 2A South play gets going this week is the battle of the Jordans. San Juan’s dual-threat quarterback Jordan Blake is a serious threat passing and running and also excels on defense, where he has intercepted three passes. Beaver’s answer is Jordan Hardy, who runs it well and has tossed 11 touchdown passes so far. He also has picked off a pass. What the Jordan’s don’t take care of for these two extremely talented teams is handled by some very talented two-way players. Kavika Su’eSu’e (347 yards rushing with six TDs), Jaxon Lee and Dylan Ivins provide San Juan with a lot of firepower, while Tyce Reddon, Taylor MacDonald, Dillion Smith and McCoy Bergstrom counter for the Beavers. If someone’s going to challenge South Summit in 2A North play, it might be American Leadership Academy. ALA is led on offense by the power-running game of Dallen Short and Owen Huff and that duo also drives the team’s defensive efforts. South Summit counters with an attack that is much more air-friendly, was quarterback Nick Beasley has thrown for 971 yards through four games, with 11 passing touchdowns. Beasley has also run for five TDs. With Parker Grajek, Keagan Stracher and Brandon Dansie as receivers, Beasley seems to have unlimited options when he drops to throw. It’s probably a good thing that ALA sticks with the run as it will help it avoid one of the Wildcats’ biggest defensive strengths, a pass rush that has sacked the quarterback 15 times. Broughton Flygare, Jaxson Sargent and company will be dialed in on the run game this week. This might be the most interested matchup of 1-3 and 4-0 teams in a long time. A rough schedule put Dixie, the state runner-up a year ago, in an 0-3 hole to start the season, but the Flyers picked up a win in their final non-region tune-up last week. Now, we find out how that schedule prepared Dixie for the daunting nature of 3AA South play as they face unbeaten Pine View right off the bat. Malakai Fakahua and the Flyer defense will have its hands full trying to stop a Panther offense that can beat you a lot of different ways. Option 1 is Jacob Mpungi, who has run for 582 yards and five touchdowns so far, and who is gaining 11 times per carry. The counter comes from the passing game triggered by Ryan Javines, who has thrown for 790 yards and 10 scores, with Michael Moten and Hudson Reed as his top targets. That’s a lot for Dixie to deal with. The Flyers want to throw it, probably more than almost any team in the state. Jacob Barben throws it 28 times a game, and he has 1,215 yards passing (more than 300 yards per contest) and six passing TDs. With Hobbs Nyberg (29 catches, 20 yards per catch) and Josh Topham on the outside, it’s no wonder that Barben wants to live up top. The Dixie quarterback has also scored four rushing touchdowns just to keep defenses off balance. It will be a good test for a Pine View team that has outscored its opponents 154-29 so far.